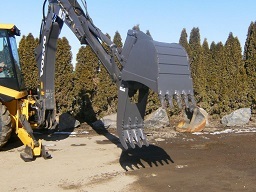 For backhoes and excavators,this new unique attachment features the thumb and hydraulic cylinder anchored to the bucket rather than to the bottom of the stick. 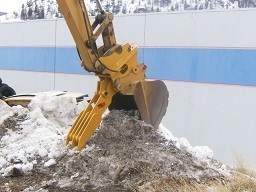 The thumb once installed becomes a dedicated part of the bucket. 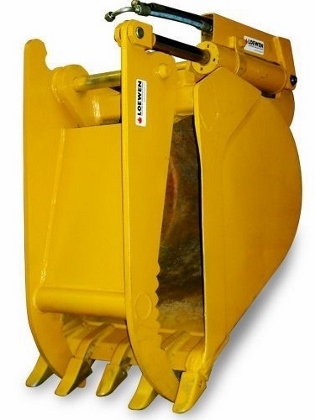 The thumb can be ordered without a bucket for you to fabricate to your bucket, or can be ordered with a new bucket as a completely coordinated set. The Bucket-Thumb can be installed on nearly any stick for any excavator or backhoe, including those with cast iron booms. Now nearly any telescoping stick or extendahoe can be outfitted with a hydraulic thumb. 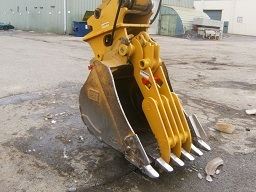 Since 2009 EQUIPMENTLAND has developed this unique attachment that features a wedge lock quick-attach which includes a hydraulic thumb. 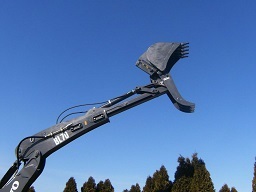 The Quick Attach Thumb can be ordered for nearly any stick for any excavator. 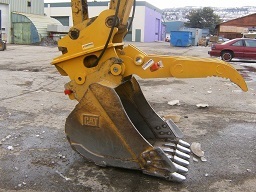 The Thumb remains on the quick coupler and is used with any bucket or rake of the appropriate tip radius. The thumb is easily removable from the coupler and additional thumbs can be ordered with a different width or tip radius.